A Phuket Phi Phi tour takes you from one of Thailand's largest holiday destinations to one of Thailand's most celebrated coral islands. Multiple tour boats and speedboats leave Rasada Pier and the Phuket marinas every day to marvel at the islands where they made the movie 'The Beach' and snorkel the 20km of reef. The meeting point for a Phuket Phi Phi tour is the reception of your hotel on Phuket. The hotels and resorts are on the west coast of Phuket so there is often a 40 minute transfer over the magnificent Phuket Highlands at the Patong or Kata passes, and then down over the plains on the east coast. The mini bus transfers take you to various ports (Rasada, Ao Po) and marinas (Boat Lagoon, Royal Phuket Marina) on the east where you board you cruise, dive boat or speedboat. The highlights of the Phuket Phi Phi tour start early as, even though Koh Phi Phi is 48 km from Phuket island, the towering cliffs can be seen over the horizon. Virtually all tours spend time at Maya Bay and this is the location where Leonardo Di Caprio created the movie 'The Beach'. Maya Bay is an almost perfect ring of cliffs surrounding a perfect beach, and according to the movie, the beach that drives 30 backpackers to set up in paradise way off the beaten track. For many, arriving at Maya Bay 'The Beach' it is a eureka moment, a place so dazzlingly beautiful that it is the key memory of their trip to Thailand. 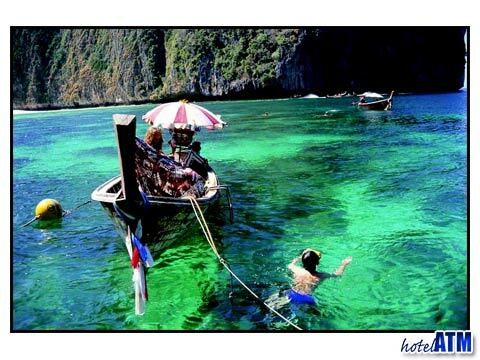 The Phuket Phi Phi tour often takes you round Phi Phi Ley Island as this is where Maya Bay 'The Beach' is. Maya Bay has a long coral reef which is fun to snorkel and near the entrance there are many huge boulders where shoals of juveniles gather and the occasional turtle comes out to surprise you. 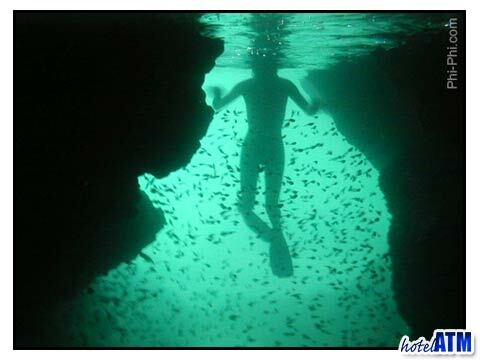 Beyond Maya Bay there are 2 other main snorkel spots at Loh Samah and Pi Ley. In low season May till October 31st the wind is from the west and so these are the dominant snorkel stops. The main Phuket Phi Phi tour for sightseers is the One day tour on the Sea Angel cruiser. As the largest and most comfortable boat you are able to use the promenade deck during the 1 hour 30 minute crossing to the islands to take in the scenery of the Phang Nga Bay. The Sea Angel stops at Phi Phi Don and you can choose to spend more time on Phi Phi Ley, head out to Maya Bay and or do snorkeling. This popular tour is ideal for those who prefer their comforts but has equal options on the island for adventure. The speedboat Phuket Phi Phi tour is geared more toward adventure, for those who want to get out to the reefs quick and spend a lot of time snorkeling. The first stop is often at Bamboo Island the National Park at the northern end of Koh Phi Phi Don. Moving between Monkey beach under the towering cliffs, Runtee Bay and Phi Phi ley this is a great tour to explore many differing underwater habitats as well as enjoy some good food and of course the thrill of speed! The diving Phuket Phi Phi tour leaves from Chalong pier in the south east of Phuket island and takes you out to Phi Phi Shark Point. Here the Leopard shark guard the rocky reef covered with anomie. From here the tour takes you 500 meters to The Wreck of the King Cruiser that sank in 1997. On the return the walls of the Koh Doc Mai provide an interesting contrast to the deeper earlier dives.